The Sharp FP-A80UW is the most complete Plasmacluster air purifier to date. It’s the first to properly challenge the might of other well-known brands, like Winix HR1000 or Rabbit Air BioGS 2.0. You will see a new ‘sharp’ design, as well as all round powerful specs so you can’t ignore this air purifier. Sharp is going on four years in our country, and it’s still never had the standout air purifier that shows it is a decent competitor to those American brands, but we hope after reading our Sharp FP-A80UW Review, you may know one. As a giant in electronic product manufacturing history, Sharp stepped in the air purifier industry long time ago. But only after 2016, this brand has started their subsidiary in our U.S country. Their air purifiers feature the very high-quality True HEPA filter, as well as the exclusive technology named Plasmacluster for the air cleaning process. The Sharp FP-A80UW is considered the flagship of this brand, with the most powerful fan power and performance. If you are not convinced, you really need to read this Sharp FP-A80UW Review. Sharp flagships are a rare breed, not just in terms of new models, but popularity as well. Almost four years have passed since the first Sharp FP-F50UW entered the American market, and a lot has happened in that time, not least the evaporation of this brand’s already paltry market share. The Sharp FP-A80UW, nominally the last flagship-class device in the classic air purifier era, before this brand moved on to the Sharp KC-850U, with an addition of humidifier function. Now, the Sharp FP-A80UW is still and elite-tier device that Sharp needs in order to compete. With the current high quality of its True HEPA filter, an improvement in fan power is becoming the norm rather than the exception, there’s little room for compromise at the top. This Sharp FP-A80UW is also the dream of this brand to make great air purifier for everyone, and seeing the Plasmacluster as the technology conquer the world of air cleaner. But it is quickly replaced with a more modest ambition, making devices to reward fans who knew this brand through the lean times. For the price of this Sharp FP-A80UW, you must pay for $389 as written in Sharp website. The price is not too high if compared with the previous Sharp FP-F60UW, and given the much better fan power, it gets more chance to shine in the aggressively competitive mid-range segment. To be fair, this is a very stable position for the most well-known air purifiers, like Rabbit Air BioGS 2.0, Levoit LV-H134, GermGuardian AC9200WCA and Alen BreatheSmart 45i. These American air purifier brands have more present than our today unit, and in top-of-mind of the common consumers, the Sharp FP-A80UW is just an unknown device. But after rigorous tests, we all have good reviews for the Sharp FP-A80UW. If you can get a good deal for this device, don’t hesitate to buy it. Sharp FP-A80UW Plasmacluster Ion Air Purifier with True HEPA Filter. Energy Star rated. Recommended for large living room areas up to 454 square feet. True HEPA filter can last for 2 years. The Sharp FP-A80UW starts first with a design named Sharp FP-A60UW, and it has a lot of differences for the older machines like Sharp FP-F50UW or Sharp FP-F60UW. At first glance, the Sharp FP-A80UW is almost totally unremarkable, at least from the front. The plate is distanced from the air intake grill, instead of setting the grill on the back, and I feel a connection to its rival from Korea – the Winix WAC9500. It removes the base completely, and with the height of 24 inches, the Sharp FP-A80UW can hold the ground firmly without any trouble. My personal hate is only for the ugly carving of Sharp logo near the bottom. Maybe it makes the air purifier sharper, but I still like the elegant design from the predecessors, such as the Sharp FP-F60UW. Though you still have the classic bottom-to-top air flow system, the outlet air vent is now on the direct top of this air purifier, and you can enjoy the fresh air easier. However, the control panel has been moved to the front, and in my opinion, it is annoying to change the settings of this air purifier. I have experienced the same problem from testing the Winix WAC9500. The rear of the handset also tends towards a corporate look and feel. The handles are much smaller, but it is still convenient enough to move this device. This may sound like a minor detail, but as someone who has known the Sharp air purifiers for years, I found the back design concept of this Sharp FP-A80UW great throughout my review period. It is something that you can put anywhere in your home, without worry about it’s becoming unsuitable. For the weight of this Sharp FP-A80UW, it is 17.6 lbs, and you won’t find any trouble moving it hundreds times per day. As the most important criteria to decide the performance of one air purifier, normally we will check the air filtration process and what air filter types are used. Just like others in this brand, the Sharp FP-A80UW still features the signature 3-stage air cleaning system. Day-to-day use is pretty good, especially when the Sharp FP-A80UW combines the unstoppable True HEPA filter and Plamacluster technology to trap any airborne contaminants in your home. When you see a certified True HEPA filter, you will know this thing can remove 99.97% of any down to 0.3 microns particles in the air. We don’t count the effect of its Plasmacluster technology. But first, you must want to know what is the Plasmacluster, right? Well, the Plasmacluster technology is exclusive for only Sharp, which is actually an ionizer. It emits both negative and positive ions, to give water in the air a positive charge and oxygen a negative charge. Through plasma discharge, in which voltage is applied to the discharge electrode, these ions will bond on the surface of airborne viruses and other substances, and change them into OH radicals. This process is called “hydroxyls form”, and the Plasmacluster technology can decompose the protein and suppress the activity of viruses, mold spores and bacteria. The result of this process is water (H₂O), which is returned to the air. With such powerful combination, the Sharp FP-A80UW can guarantee the fresh air for your home. Moreover, Plasmacluster is made up of both positive and negative ions and therefore reacts to both, so it can remove static electricity easily. To test the practical use of this Plasmacluster technology, I put this Sharp FP-A80UW into a room of 300 sq ft, and let it run for a full hour. I also added the Winix HR950, Blue Pure 121 and Alen BreatheSmart FLEX into this test to compare with the efficiency of this Sharp FP-A80UW. The final result, the Sharp FP-A80UW and Blue Pure 121 are both the clear winners with an efficiency of 99.95% for any particles ≥ 0.3 microns. The Winix HR950 (and even the Winix HR1000) can only clean 99.92%, while the Alen BreatheSmart FLEX dropped to just 95%. The Sharp FP-A80UW is not only powerful, its True HEPA filter can last longer than normal HEPA ones, and up to 2 years. With the filter cost of around $50, you only need to pay $25 for the annual filter cost. If you compare this cost with the air filter cost of Oransi OV200 or Oransi Max, you will see the difference. The best improvement of Sharp FP-A80UW is the fan power, and because this is the second most important criteria, we can compliment the Japanese brand for making such high-quality air purifier. The Sharp FP-A80UW is meant for large room, and it can clean a room of 454 sq ft with no problem. The ACH of Sharp FP-A80UW is 4X. With this air changes per hour rating, this air purifier can clean your room every 15 minutes. The CADR of Sharp FP-A80UW is 303 Dust/ 293 Smoke/ 360 Pollen (cfm). Finally, we have a Sharp air purifier that can clean this quick. With high CADR rating like this, the Sharp FP-A80UW can easily surpass the Levoit LV-H134 or Austin Air HealthMate Jr in the same price range. Sharp described their air purifier with the LibraryQuiet operation, and the Sharp FP-A80UW is really, really quiet. Though the fan power is upgraded, Sharp still keeps the noise level of their air purifiers as low as possible. In the case of Sharp FP-A80UW, the lowest noise level is only 23 db, which is even quieter than the Rabbit Air MinusA2 Ultra Quiet air purifier. This is exactly the noise level of the rustling leaves, and you won’t notice any sound at all. If you run Sharp FP-A80UW on highest speed, the noise level is still 55 db. It is noticeable, but it is just like other electric appliances in your home. So to say, I suggest using this Sharp FP-A80UW in any places that require the silence, like your office or bedroom. The Sharp FP-A80UW is Energy Star rated, and it will only run at 5W for the lowest setting. There are not so many air purifiers that can compete with the Sharp FP-A80UW in terms of power consumption. But when you run on the highest speed, the power consumption is really, really high, up to 98W. For running the Sharp FP-A80UW 8 hours per day, you need to pay $0.2 to $35 each year. Even if you always run on highest fan speed, the power consumption is just only $0.1 each day, to keep your indoor air quality as good as possible. If there was one advantage in waiting so long before bringing out the elite Sharp FP-A80UW, it was that this Japanese brand has packed a lot of necessary features into this air purifier. As such, the Sharp FP-A80UW comes well equipped, both by the standards set for 2019 and for the future. Sharp has worked hard to bring back the beloved Smart Sensor, which for unknown reason is removed in the Sharp FP-A60UW, in our today Sharp FP-A80UW. There is no need to repeat the necessity of this sensor, but any modern air purifier needs to acquire it. The Smart Sensor can help your air purifier precisely react to the current indoor air quality, and change the most suitable fan power to match it. As a result, the Smart Sensor will have you preserve the energy better, and improve the life time of your True HEPA filter. Do you see the button with a cluster of grapes? This is the button to turn on/off the Plasmacluster function. Sharp said that when water molecules surround ions that are generated by plasma discharge, the result looks much like a cluster of grapes. If you hold this button, you will activate the Light dimmer function, mainly for bedtime use. There are no Child lock and Off-timer functions in this Sharp FP-A80UW, but you will still enjoy the Quick Clean function. Whenever you need the maximum performance with only one button, just press it, and the Sharp FP-A80UW will continuously discharge strong air flow cycles, and release the high-density Plasmacluster ions to remove the airborne allergens as they are drawn through the filter systems. Energy Star rated, powerful air filtration process, improved fan power. It seems there is nothing you can complain about this Sharp FP-A80UW, which is clearly the best air purifier of this brand. Should I buy Sharp FP-A80UW? Yes, you will have everything when buying this Sharp FP-A80UW. Top-notch and creative air filtration process, great fan power, smart feature are the most highlighted things when mentioning the Sharp FP-A80UW. 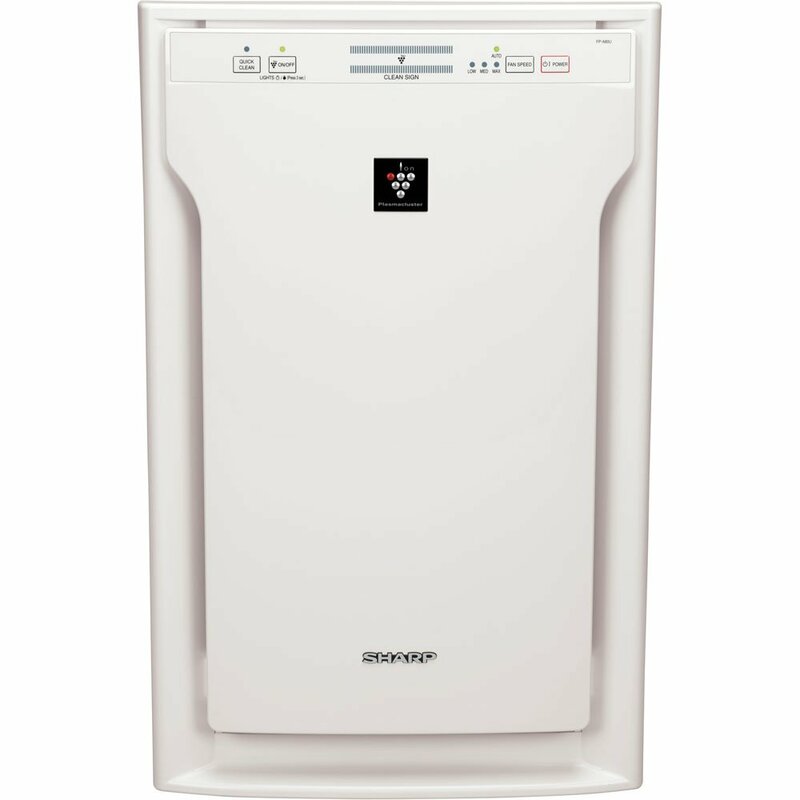 If you have serious allergies or asthma to airborne pollutants: the Sharp FP-A80UW is great with True HEPA filter and the Plasmacluster technology. If you want a better performance, or better fan power to clean your room faster: you should check the Blue Pure 121, as this is the only air purifier with higher CADR rating in the same price range with Sharp FP-A80UW. If you need an air purifier with a better room coverage: you could look for the Austin Air HealthMate Jr, Austin Air Allergy Machine Jr, Alen BreatheSmart FLEX and Alen BreatheSmart 45i, as they all have better room coverage than this Sharp FP-A80W. Also, the Oransi Max has the largest room coverage, with 1100 sq ft. If you need a budget version of this air purifier: you can buy the Sharp FP-F50UW or Sharp FP-F60UW instead. And don’t forget the trio of Winix C535, Winix 5300-2 or Winix 5500-2, they are still good and cheaper than this Sharp FP-A80UW. If you need a more silent air purifier: the Sharp FP-A80UW is quiet for the price, and you can also research for the Winix NK100 or Winix NK105. You can’t go wrong with this powerful air purifier of Sharp.